Sandwiched between St Raphael to the North East, and Saint Aygulf to the South West, and some twenty kilometres to the North of Saint Tropez, Frejus, in the South of France is well known for its Roman remains. Sporting one of Europe's largest amphitheatres and a number of other Roman ruins, the town also possesses a number of medieval towers. Originally called the Jullii Forum (after the Roman Emperor Gnaeus Julius Agricola) the town's name soon evolved to become Frejus. Emperor Agricola placed great importance on the port of Frejus, building a port capable of welcoming cargo ships from all over the empire, setting up a market for selling and buying imported goods, establishing the Colonia Octaviorum, a retirement complex for verterans of the Eighth Legion and establishing the town as the base for the Roman Empire's Mediterranean fleet. Over time though, with the Roman empire fading, and the port silting up, the town became less and less important. It wasn't until the 10th century that the town's fortunes improved. Bishop Riculphe is credited with the building of the 'new town', but he was continually thwarted by pirate attacks which slowed the town's progress down. The above photo shows the Roman ruins of the Porte des Gaules, now missing its facing stones. To the left, and shown below, a medieval tower has been 'tagged' onto the end, utilising the line of the port's walls. I'm under the impression (though this has to be confirmed) that this tower and the wall marks the extremities of the old medieval town, possibly indicating that Frejus was once a walled town. 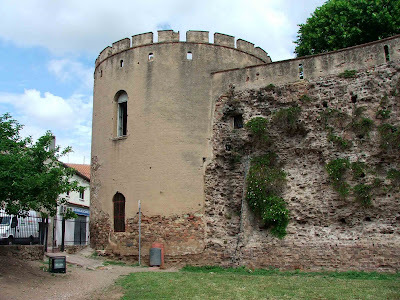 As far as I can tell, the tower shown below, was the original palace for the Bishop of Frejus, probably built in the latter part of the 11th century, with additions being made into the early part of the 12th century. The tower is three storeys tall, with a vaulted hall on the second floor and a terrace on the roof, originally designed to take a dozen canons for the town's defence. The building has lower walls some three metres thick, and was designed to accommodate the Bishop, his family and other town dignitaries, and would have formed part of the original town walls. In the 13th century, a separate building was erected, possibly shown above, where all the town's canons were moved to. As I trawl through the French language web sites with information on these towers, I'll update this post. Although only a tentative possibility of a fortified building exists here, I thought it would be good to include it anyway. 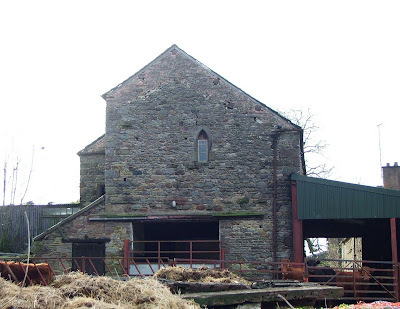 Little Strickland can be found about 5 miles South of Penrith, just off the A6 and behind Thrimby Grange. Finding the Hall was a little difficult, as the building is set back off the B road and is situated amongst all sorts of buildings on a working farm. I think that the photo above represents the end of one of the wings....although if anyone tells me otherwise I'll go with that!! From a historical documentation point of view, the site has always been described as a hall site with towers, although it's thought that the towers were either built over, or incorporated into the present buildings. Some historical texts describe the site as having a 9 feet curtain wall, so it was fairly well defended. The hall was most likely built for the Crackenthorpe family, some time around 1540, although there are a number of 16th, 17th and 19th century buildings and alterations present. The photo above, if actually of the hall, was a very narrow view, only available from the grass verge of the small road running nearby.